Among the children who missed an entire summer of climbing trees, and the adults whose thirst for spring was never quenched, were the millions of crops that couldn’t survive the weather. For the asparagus to the arugula, from the patches of parsley to the rows of peas, almost nothing made it through the cold. “The Year Without a Summer” was caused by a perfect storm of natural conditions. Four years of heightened volcanic activity, capped off by the violent eruption of Indonesia’s Mt. Tambora in 1815, was combined with a period of unusually low solar exposure, and altogether it prevented the sun’s rays from piercing the dust clouds and warming the earth. The lack of sun affected the entire northern hemisphere, and due to lack of harvest, eventually the whole world. The crops and people of the northeastern United States, Atlantic Canada, and Western Europe bore the brunt of the cold. But there was one hardy crop, found in the depths of New England’s cornfields, that survived—a plant we know fondly as Indian corn. Indian corn, otherwise known as flint corn, has a very low water content and is therefore more resistant to freezing than other vegetables. Each kernel has a hard outer layer to protect the endosperm, and it is through this solid shell that it is likened to being as hard as flint. Indian corn was one of three original types of corn cultivated by Native American tribes such as the Pequot and the Algonquin. Bold in its varieties of purples, blacks, oranges and yellows, each kernel on a flint corn cob contains its own set of genes. And while Indian corn rarely still sits on the dinner tables of North Americans, its history is deep-rooted in our cuisine. The relationship between the Native Americans and flint corn is one of hungry interdependence. Just like the natives of thirteenth and fourteenth century North America relied heavily on corn for sustenance, so did corn rely on their caretakers for life. Without humans, corn does not exist naturally in the wild; it can only survive if planted and cared for. According to scientists, corn was likely developed by natives in central Mexico 7000 years ago, originating from a wild grass called teosinte. Since then, corn has evolved into many varieties, including delicious sweet corn, which was the result of a natural spontaneous mutation of field corn, also cultivated by Native Americans. 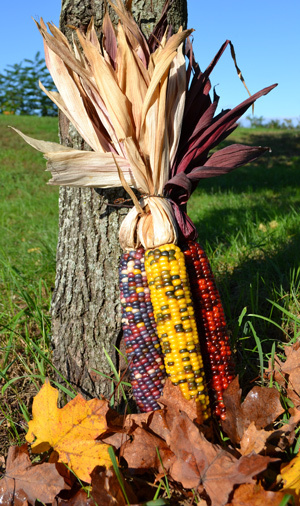 Now, almost two centuries after that ill-fated summer in 1816, Indian corn has evolved from a food source to a staple of autumn décor, adorning outside stoops and sitting among the pumpkins. But if not for Indian corn and its immunity to that summer’s bitter shortage of sun, people along the northern Atlantic coast would have suffered even more from the lack of crops. Indian corn’s significant place in harvest history, therefore, remains as strong as the very plant itself. Natalie lives in Massachusetts and spent many glorious autumns jumping into her father's heaping leaf piles and many fragrant springs sniffing her mother's iris. She is a freelance writer and loves it when nature and writing can collide.